How much does it bother you when people mess up there grammar? So much that you can’t even here what their saying, you just want to take out you’re red pen and patrol all of they’re missteps? We’re sending this one out to the educators and the grammar police of the world! Some may find it a little annoying, and even a little invasive, but in the long run, you’ve spared us much embarrassment with all the red ink you’ve left on our essays, interjections during our presentations, and on-the-fly lessons in the hallways after wincing at our butchered grammar. We may hate it in our youth, but you’ve helped us all improve our grammar so that we can do great things one day–like blog about t-shirts! For the non-educators, we’re not rigid, prescriptivist grammarians, but we do know the importance of good (not well) grammar. If you don’t think it matters, take a look at the first tee on our list. They sound the same, sometimes they’re spelled the same, and sometimes they’re not, but always beware of the homophone. There are many more detrimental, and embarrassing instances of confusing your homophones than those above. There, their, and they’re, however, are some of the most commonly confused homophones. Educators, we thank you for clearing the air (heir) and correcting all our typos. You are saving the world a lot of misunderstanding. This one goes out to all the bare bears and bizarre bazaars you may come across this year on term papers. If you don’t pay attention to your comma use, then something bad might happen to Grandma! Who would have thought that punctuation can save lives? Although, if you’re a teacher, we don’t suggest telling this to your students. Imagine coming across a sign that reads, “Caution: Pedestrians Slippery When Wet.” Is that a warning or a creepy tip? It is no wonder that your English teacher circled all your comma splices and missing punctuation. We thank you for all the red marks on our papers. You may have saved a life, or at the very least, you may have made a pedestrian feel more comfortable. Teachers, if you get a little bored teaching with grammar direction from Strunk and White, try on Eats, Shoots & Leaves by Lynne Truss for a more engaging look at how it isn’t just our words that form meaning, but also our punctuation. This one literally drives us up the wall…or does it? It is literally one of the more annoying trends in modern speech—using literally in literally the opposite way of its meaning. When it is one class period before lunch time, you’ve likely heard a student or two talk about how they are literally starving. Perhaps a lesson in the proper use of literally—and potentially one in hyperbole—would be useful. From the accidental blunders of Vice President Biden, to the comical use of “literally” by Rob Lowe’s character Chris Traeger on Parks and Recreation, we see that literally no one is above the misuse of this word. 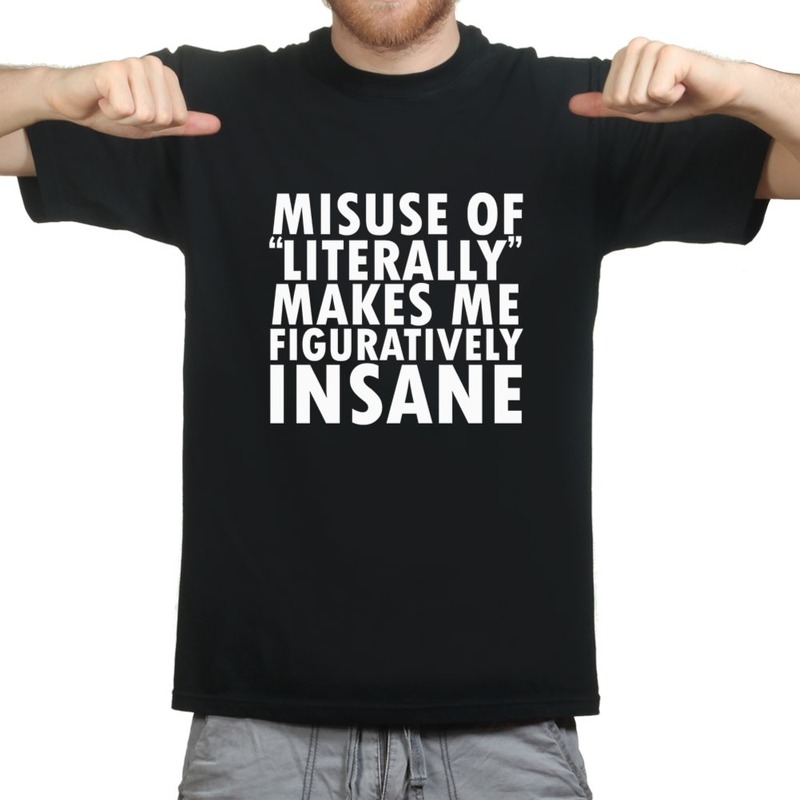 Teachers, its okay to figuratively cringe when the “literally’s” fly around this school year, but a gentle correction will go much further than a wince. You’s better use the right pronouns…or else! So, it is used, technically speaking, within a set of guidelines and rules. It’s not just you’s. Pittsburg has “yinz,” the South has “ya’ll,” and we’re sure plenty of other places have their very own. Is it wrong? Perhaps in English 101 or in a job interview, as they are such hyperlocal, colloquial pronouns, but prescriptivists outside the classroom better refrain from correcting this one, or else you’s are heading for trouble! If there’s one thing that can grab anyone’s attention, its a cat. 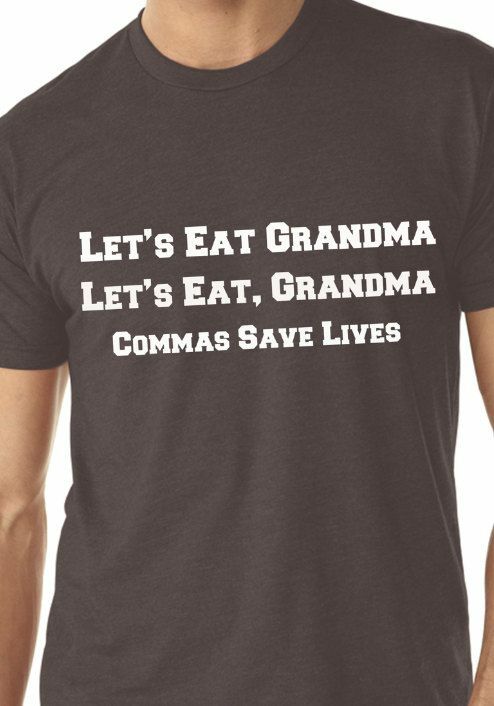 We printed this adorable grammar t-shirt right here on our production floor. This creative use of the homonym reminds us of two important grammar rules: the proper use of a comma, and the importance of spelling your homonyms right! Although we don’t always like to admit it’s back to school time, hopefully you’re going into it with a fresh mind. Your about to teach a whole new pool of students the difference between “there” and “their,” and run through ten fresh packs of red pens. Along the way, you’ll save a lot of embarrassment with your grammatical interjections. We didn’t hate the red pen marks the Grammar Police left on our essays, we cherished them. And before we knew it, we were in the real world going through a grammar police blog post for errors. If you find any, let us know on Twitter! Ryan R. Latini is a freelance writer working in the Greater Phildelphia Area. Check out his website, The Narrative Report at www.ryanlatini.com, or follow him on Twitter @RyanRLatini.